Set off on a journey of discovery and explore France's top destinations on this four-day tour. With an experienced guide-interpreter from our team, you will start by exploring Normandy with the towns of Rouen and Honfleur and a tour of the D-Day Landing Beaches. The tour continues with a visit to Saint-Malo in Brittany and Mont Saint-Michel. The last two days will be spent touring the most famous Châteaux of the Loire Valley with your guide. Take a seat on our air-conditioned bus, which leaves our agency in the center of Paris at 7:15 am. After a two-hour ride on the Normandy highway, the bus will make a stop in Rouen. There you will go on a walking tour of the city's historic district featuring the beautiful Notre Dame Cathedral, Gros Horloge (an astronomical clock that is one of the city's treasures) and half-timbered houses. The pedestrian streets, which date back to the medieval era, give Rouen a unique charm that served as the inspiration for many Impressionist painters. Claude Monet painted several views of the Cathedral. During the trip to Honfleur (90 km from Rouen), you will pass the striking Pont de Normandie suspension bridge that spans the Seine estuary. In Honfleur you will have some free time during which you can explore the harbor town with its picturesque streets and incredible houses with slate façades. Enjoy lunch at one of the town's restaurants. Be sure to sit on the terrace to take in the sights of this typical Norman harbor town. The coach will then take you to the Beaches of Normandy, which are the must-see World War II sites where the Allies landed in 1944. First, you will stop at the impressive American Cemetery in Saint Laurent/Colleville sur Mer, which covers 70 hectares. Located above Omaha Beach, this site honors the American soldiers who lost their lives during the Battle of Normandy. After driving for another half-hour, the bus will make a brief stop at Arromanches beach. You can still see the remnants of the pontoons for the artificial harbor that was built in England and brought to the site by the Allies so that they could land at high tide. Then you will be taken to the Caen Novotel (or a similar hotel) where you will have dinner and spend the night. The second day is spent in the Brittany Region. After breakfast, the bus will drive for about two hours to the fortified city of Saint-Malo, which was once infamous for its privateers. First you will go on a guided tour of this beautiful city and its considerable historic heritage, and then you will have time for lunch on your own. Notable sights include the city walls, Château, Saint-Malo Cathedral and Fort National. The bus will then leave this Breton town to take you to Mont Saint-Michel. No trip to France is complete without a visit to this town perched on a rocky peak. Let your guide lead you to the town entrance with its drawbridge and along the Grande Rue, which ends at the famous abbey on the top of the mountain. Enjoy a guided tour of this Gothic Benedictine abbey, which boasts a refectory, cloister and garden offering a superb panoramic view of the sea. 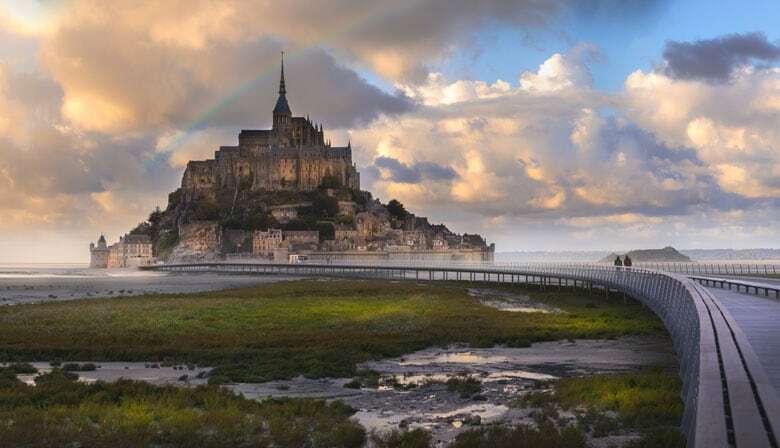 Afterwards you will have some free time during which you can stroll the bustling streets and take in the incredible view of the Mont Saint-Michel bay while you make your way down the city walls. The bus will leave Mont Saint-Michel at 4:30 pm for Angers. About three hours later the bus will drop you off at the Angers Centre (or a similar hotel) where you will spend the night. You will find many restaurants near your hotel to have dinner. About 100 kilometers from Angers lies Château de Langeais, the first stop on your tour of the Loire region. Your guided tour of Langeais, which is a mostly intact fortress, will take you on a journey through French history thanks to the castle's depiction of medieval life made with highly realistic wax figures. After this first Loire Château tour you will have lunch in Amboise, about 45 minutes from Langeais, at a restaurant of your choosing. The early afternoon will be spent touring Château du Clos Lucé, which is just a ten-minute walk from Château d’Amboise. Built in 1500 and now a UNESCO World Heritage site, this French castle was where Leonardo da Vinci spent his last years. On the guided tour you will learn about the private life of this Renaissance genius who spent the last three years of his life there as the guest of Francis I. The artist died at the château in 1519. The next stop on the tour is Château de Villandry, about sixty kilometers from Amboise. Your guide will lead you through the Villandry Gardens. Magnificent paths lined by linden trees separate the various parts of the garden with its many terraces and themes. The lush vegetation and incredible colors are sure to delight you. You will then settle in and have dinner at the Mercure Tours Nord (or a similar hotel). The last day of the tour will be spent visiting three of the most beautiful Châteaux of the Loire Valley. After having breakfast in Tours, you will board the bus and set off for Château de Chenonceau (about 30 kilometers away). On your guided tour of Chenonceau, you will have the chance to admire this splendid château with its lavishly appointed rooms. A Renaissance masterpiece, the castle's unusual architecture makes it look like something out of a fairytale that has just emerged from the Cher river. Called the "Château des Dames", Chenonceau was built and renovated over many years by several famous French women such as Diane de Poitiers and Catherine de' Medici. After a 45-minute ride the bus will drop you off at Château de Cheverny. During the guided tour of this 17th-century aristocratic estate, which is still inhabited by descendants of the original family, you will learn how French people once lived by visiting the birthing room, the small boudoir and the private dining room. Cheverny boasts exquisitely decorated royal apartments and a grand park with an impressive pack of hounds that participate in hunts to this day. Lunch will be served at the Saint Hubert Cour Cheverny (drinks not included). The trip culminates with a tour of the most majestic of the Châteaux of the Loire Valley, Château de Chambord, which is about 20 kilometers from Cheverny. During your guided tour of Chambord you will be impressed by its fascinating architecture. Be sure to admire the imposing, intricate double-helix staircase and visit the former royal chambers and other rooms located on the castle's many levels. Take in the panoramic view of Chambord's park from the immense terrace, decorated with impressive chimneys. The bus is scheduled to leave Chambord around 4:30 pm and return to our agency in the center of Paris around 7 pm. The reproduction of the well-known fresco "The Last Supper" painted by Leonardo da Vinci will be exhibited at Clos Lucé castle, from June 7th to September 2nd. Usually presented at Vatican museum, the castle welcomes it for Leonardo da Vinci death anniversary. Here is the occasion to admire this 9,15 meters long and 4,90 meters high masterpiece, inspired by the biblical scene. Come and enjoy with your family these two weeks (from April13th to April 23th) during which events will be organized. Immerse yourself in Leonardo da Vinci world, discovering science and art. Many surprises await you. 500 years after its construction, the Chambord castle returns on King François I and Leonardo da Vinci project from May 26th to September 2nd. To trace this story, 150 works will be presented to help you to understand the architectural achievement as the open double-spiral staircase, imagined by the italian artist. In parallel, you will find some projects realized by students of the best architecture schools in the world on the theme : Chambord in the future. This exhibition is suitable for children. In the case of a booking requiring a single room, a supplement of 121€ will have to be paid at PARISCityVISION agency prior your tour departure. - For a booking of 3 people: you will be in a double room and a single room. In that case, you will have to pay the 121€ extra upon the departure. Triple rooms are unavailable. It is an itinerary that, in just a few days (four), manages to give a general yet quite comprehensive overview of some of the most famous regions in France, with a particular focus on history from the Middle Ages to the 20th century, Gothic and Renaissance architecture, and the incredible landscapes that won't be lacking on this adventure. Outstanding tour director and driver-they were 100% customer oriented. The hotels were great, clean and well appointed. I was totally satisfied with this tour. Well organized, ran to schedule each of the 4 days, knowledgeable guide and safe driver - both interacted very well with all participants on our trip. Structured to provide an excellent overview in the available 4 days. Our tour guide Pascal was amazing - such an in depth knowledge base and excellent communication meant that we didn't just see the sights, we gained a genuine understanding of the history behind what we saw which added so much to the value. The trip did feel like too much was being squeezed into too little time - maybe one less stop each day but a bit longer at the best attractions like Mont Saint Michel and Chenonceau would have made the trip better. Excellent!! Lovely accommodation. Amazing tour guide Pascall! Lots to experience.